The refining sector is the Group’s core activity, accounting for approximately 75% of the total assets. In Greece, the Group owns three out of the four refineries operating in the country, holding approximately 65% of the Greek oil products wholesale market. The Group’s domestic refineries at Aspropyrgos, Elefsina and Thessaloniki cover approximately 65% of the country’s total refining capacity, with a composite Nelson complexity index of 9.2. The Group’s domestic refineries operate as a single refining system (hub). Consequently, monthly crude oil procurement, production planning and sales forecast are integrated processes for the entire network, thus maximizing refining value and profits for the Group, always based on domestic demand and current prices in the regions of Eastern Mediterranean and Southeast Europe. The Group’s ability, due to the refineries’ increased complexity, to process intermediate products (SRAR, VGO) and adjust its crude slate and oil processing levels, considering prevailing refining economics, is a key competitive advantage. The refinery has a significant number of distillation and conversion units, including: a fluid catalytic cracker (FCC), a vacuum distillation unit, a mild hydrocracker and a visbreaker for processing atmospheric residue. It has a significant gasoline production capacity through the isomerization and reforming units (CCR). The refinery is very flexible regarding production, storage and distribution of products as it owns a large private port, an extensive crude oil distribution pipeline network from and to the crude oil unloading and storage installation at Pachi, Megara, and a distribution pipeline for finished and semi-finished products from and to the Elefsina refinery. It also has the main responsibility for fuel supply through pipeline to the "Eleftherios Venizelos" Athens International Airport. The refinery is connected to the natural gas network which yields significant savings, as fuel oil is substituted by natural gas for own use, when the price of the latter is more attractive and also from the reduction of CO2 emissions derived from the use of natural gas, as a cleaner fuel. The Elefsina refinery has a refining capacity of 106 kbpd. In 2012 an upgrade project completed, worth €1.5 billion, making it one of the most modern and complex in the Mediterranean region, with a high pressure hydrocracking unit (hydrocracker) as well as a thermal cracking unit (flexicoker). It is a strategically important refinery for the Group, due to its high storage capacity (3,3 m. m3 of crude oil and petroleum products) and the logistics infrastructure for imports and exports management, including a large private port and a tank truck loading station. The refinery is connected to the crude oil terminal at Pachi, Megara and to the Aspropyrgos refinery through a pipeline network. The upgraded refinery has significantly boosted the Group’s competitiveness, as it increased the yield of middle distillates and maximizing diesel (ULSD) production, by consuming high-sulfur crude oil. 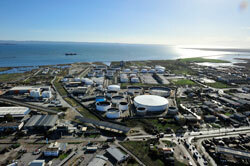 The refinery boasts a Nelson Complexity Index (NCI) of 12 and a Solomon Complexity Index of 14. In addtion, the upgrade also reduced emissions, thus significantly improving the environmental impact, while in recent years the reduction of basic gaseous emissions per unit of supply continues. The refinery has an increased flexibility in terms of crude oil supply, as it can process 100% high-sulfur crude oil, heavy crude oil products and semi-finished products in the hydrocracker complexes. Middle distillates yield (diesel, jet) exceeds specifications, reaching 70%, with the respective yield at Group level at 52%.Τhis has positively contributed to the Group’s refineries’ operating performance, with the yield of high added value products standing amongst the highest in the European refining industry, highlighting the competitiveness of our asset base, following the considerable investment that was implemented during the five-year period 2007-2012. 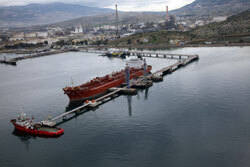 The Thessaloniki refinery is of a hydroskimming type and has a 1.4 m. m3 storage capacity. It is the only refinery in Northern Greece, having capability of supplying both the domestic market and the neighboring countries in Southeast Europe. The refinery’s upgrade was successfully completed in 2011 and consisted of into three main projects: (a) distillation units renovation, (b) storage capacity increase for better flexibility in crude oil supply, and (c) a new Continuous Catalytic Reformer (CCR, 15,000 bbl/d) as well as a desulfurization unit for maximizing gasoline and diesel production. It is connected to the Group’s facilities in Skopje through a pipeline. The new Continuous Catalytic Reformer Unit (CCR) enables the refinery to process additional naphtha from the Elefsina refinery, on top of own naphtha production, maximising the system refining margins. Moreover, its energy efficiency was improved following refinery targeted interventions works on piping and steam traps during the maintenance. In 1999, the Group acquired the OKTA facilities in Skopje through its subsidiary, EL.P.ET. BALKANIKI. 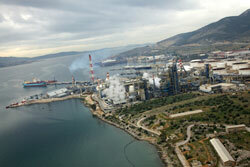 OKTA is connected to the Thessaloniki refinery through a pipeline for the transportation of high added value products. Its location offers a significant competitive advantage in terms of the distribution of products into the local market, through marketing companies, and exports to neighboring countries in the Balkans.